This disease is characterized by patches of blighted or browned grasses ranging in size from 2 inches to 3 feet in diameter. Infected plant tissue dries out and then fades to a tan color. Under damp conditions, leaves may be covered with a pink, gelatinous, thread-like growth. This growth may extend out from the leaf tips to nearby plants. Control measures include a good fertility program , mowing a bit shorter to promote rapid drying of affected areas, and a fungicide program if the problem is severe. 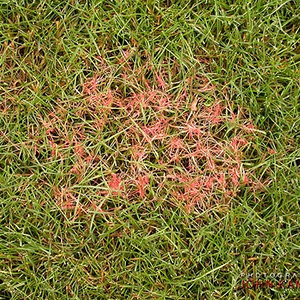 When rust is severe, the lawn may have a yellowish to reddish-orange appearance. A red-orange dust fills the air when the grass is mowed and also collects on shoes and clothing. Individual blades of grass will have slightly elongated yellow-orange to red-orange spots or pustules (filled with a rusty colored powder) that break through the leaf surface. When rust is severe, the grass blades turn yellow, wither and die. Warm humid weather with day temperatures of 85-95 F, night temperatures of 75-85 F, heavy dew, and light rains ( or watering )favor disease development. Lawns with low soil fertility, some degree of drought stress, poor drainage and soil compaction also contribute to disease symptoms. It is also apt to be a problem in shady areas, on closely cut grass, and on newly laid sod. Maintaining good lawn growth, adequate fertilization and proper watering helps to alleviate disease severity. Once normal growth is obtained, mow the grass frequently at recommended mowing heights. Fungicides are not usually needed or economical as the disease typically goes away on its own, but may be required to help protect new growth when rust is severe and weather promotes rust development. Leaf spot is favored by prolonged cloudy, moist weather, moderate temperatures, lush turf growth and shady conditions. Spots on the leaves develop purplish-red to purplish-brown borders and brown to tan centers. The spots may extend the width of the leaf and are somewhat longer than wide. Leaf spots may cause the death of leaf tips. Leaf sheaths are also infected, and may die, resulting in thin stands of grass. Melting out begins as spots on the leaf blades and rapidly moves down the leaf sheath and into crowns and roots. In advanced stages it is known as “melting out”. These patches may range in size from several inches up to several feet and may produce irregular patches throughout the lawn. “Melting out” is the end stage of leaf spot and is difficult to control. Proper watering and fertilization will reduce the danger of melting out and it is particularly important to avoid excess use of nitrogen fertilizer and evening watering. Remove excess thatch — the layer of fibrous plant tissue between the soil surface and the green vegetation. Fungicides may be needed to control leaf spot disease before it “melts out”. Their affect is temporary and beneficial only when combined with a change in cultural practices. Fungicides are most effective if the initial application is made when leaf spot first becomes noticeable and less effective when small patches of lawn begin to die. When large areas of a lawn are dead or dying from melting out, the patches should be reseeded with a resistant grass species. Various turf varieties differ in their susceptibility to melting out. Older turf varieties are often very susceptible while newer types are resistant. Moss and algae are primitive green plants often found in densely shaded and frequently wet lawn areas. The best control involves improving soil drainage, increasing the amount of sunlight reaching the ground and planting shade tolerant turfgrass varieties. Using a chemical control product is a temporary solution and injury to nearby plants is possible due to leaching. Mushrooms that appear in the lawn typically do not cause damage. However, they may be unsightly and cause people to worry that children or pets may eat them. While some mushrooms are poisonous others are not. There is no way to distinguish poisonous from non-poisonous varieties except by correct identification. There is no easy control for lawn mushrooms. Mushrooms grow on organic matter (including thatch) and decaying wood whenever excessive moisture is present for prolonged periods of time. The removal of decaying wood such as old tree stumps will reduce their food source and the likelihood of their return in future seasons. Mushrooms that do appear should be raked up, minimizing danger to children or pets. This is a serious disease of Kentucky bluegrass that is especially common on high maintenance lawns. While Necrotic Ring Spot is a fungus which is most active in the spring and fall symptoms are most noticeable during the heat of the summer. Initial symptoms are scattered light green patches 2-6 inches in diameter enlarging to form light brown to straw colored sunken, elongated streaks, crescents or rings up to three feet in diameter. Healthy turf may appear in the middle of the rings giving it a “frog-eye” pattern. The roots and crowns of affected plants are covered with black strands of the Necrotic Ring Spot fungus. Plants affected in the cooler weather of spring and fall are weakened and very susceptible to summer heat and drought stress. This stress may lead to the death of weakened plants and an apparent resurgence of symptoms, even though the fungus may not be active at the time. Necrotic Ring Spot is very difficult to control and damage may remain or reappear yearly . Control requires a combination of management practices including: thatch control, adjustment of fertilization practices, relieving soil compaction, changing watering practices, fungicides and planting of resistant varieties of grasses. To help control Necrotic Ring Spot keep the thatch layer below 1/2’’ thick. Excessive thatch contributes to shallow turf rooting. Avoid excessive use of high nitrogen fertilizers in the spring. Also keep the top 2 inches of the soil wet with frequent watering during the summer months to reduce heat and drought stress. If applied before the disease is established fungicides will aid in control. Dead patches should be seeded with resistant varieties of turf grasses. Dollar Spot causes bleached spots 4-6” in diameter to form in the lawn coalescing to form large irregular patches of dead turf. In the morning when the grass is wet with dew, cobwebby growth may be seen on the affected grass plants. In the onset of the disease leaf lesions are a light brown or tan color with a reddish brown to purplish border often in the characteristic hour-glass shape. Dollar Spot develops at temperatures of 60-85 degrees Fahrenheit with high humidity and low soil moisture. The disease usually develops on lawns which are unfertilized but occasionally occurs on high maintenance lawns under stress. It can be controlled by keeping lawns adequately fertilized and watered and by using a fungicide if necessary. Excessive thatch also contributes to conditions favoring disease development. Powdery mildew causes a grayish white, powdery growth to appear on affected grass leaves. All grass species are susceptible, especially Kentucky Bluegrass. The white, powdery growth is a combination of mycelium and spores which absorb nutrients from the leaves. In time the grass turns yellow, begins to dry up and dies. Leaves may be affected for long periods of time without significant injury. The disease is most common late summer or early fall during periods of cool, moist, overcast weather. Because powdery mildew is mostly a disease of shaded turf grass, reducing the amount of shade and increasing air circulation usually will eliminate the problem. Avoid light, frequent watering. Because it is uncommon for powdery mildew to cause significant injury, fungicides are rarely needed and not recommended for control on lawns.